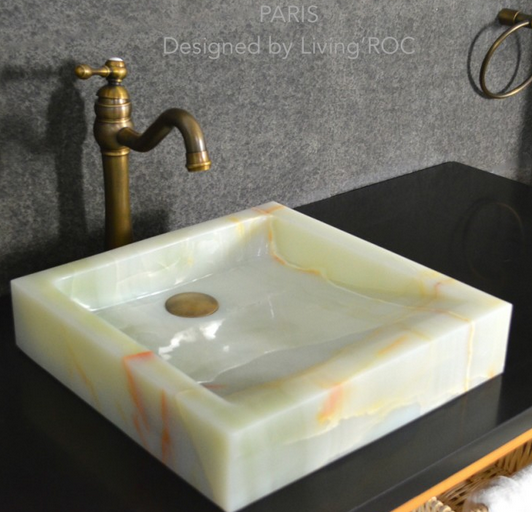 LivingRoc USA-The Blog: LETS END A GREAT YEAR WITH NATURAL STONE PRODUCTS! LETS END A GREAT YEAR WITH NATURAL STONE PRODUCTS! Let's end the year 2014 with a look back at some of our LivingRoc products whom have found their way into your homes. Thank you for sharing your wonderful projects with us. Enjoy a relaxing time with family and friends while creating some great moments together. 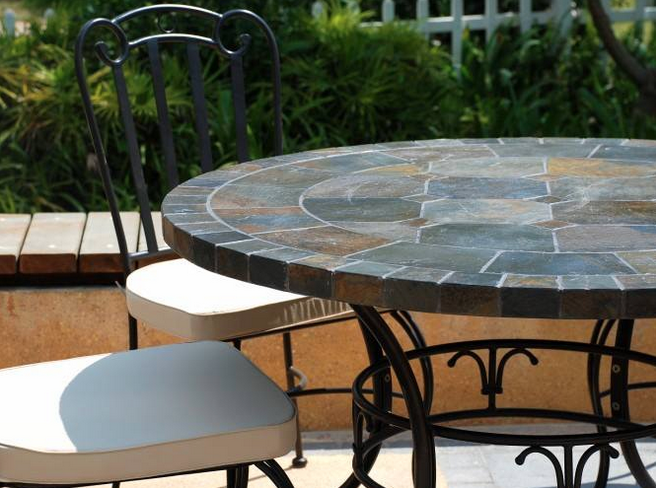 OCEANE round slate mosaic stone patio table with its beautiful mix of gray slate and wrought iron is just perfect together. We move onto our bathroom line of natural stone products. 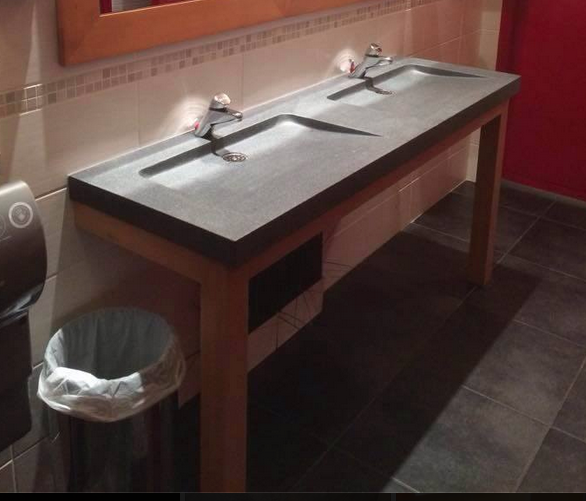 Here featured in this restaurants bathroom they have used our FOLEGE, 63" double trough sink. Adding a stone element will provide a modern, serene, and trendy atmosphere in your bathroom. Honed finishes and a very convenient slope will add practicality to beauty. Wanting to go on the lighter side? 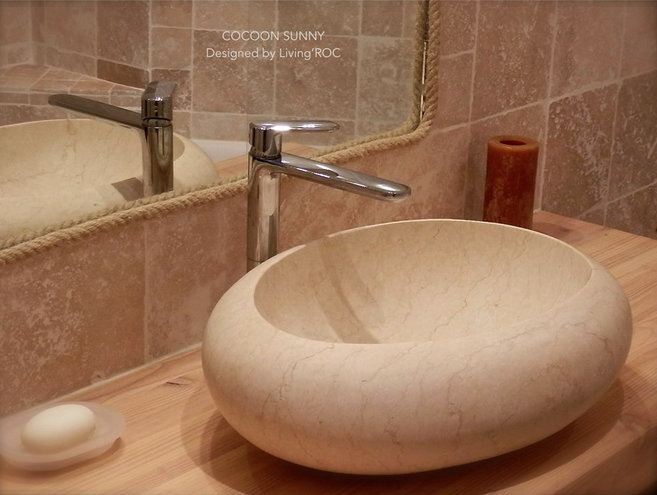 Here is our oblong vessel sink the COCOON SUNNY, made from Egyptian sunny yellow marble, this will delight lovers of beautiful work, looking for rare products. Add value to your home while transforming your bathroom into an oasis of elegance, calm, and tranquillity. To follow up and make a bathroom superb, why not add some natural stone to the shower? With a variety of sizes you are sure to find the right SHOWER BASE size to make your bathroom one to admire. Cut form a block of granite and sloped to the drain, giving you a modern look while adding beauty and sophistication to your space. 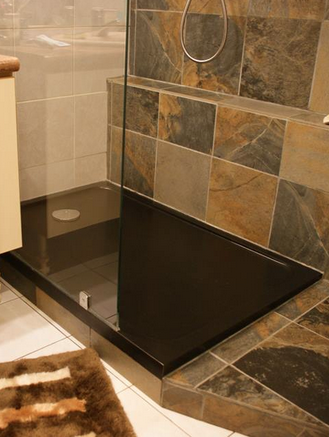 All of our granite stone shower bases have been taken care of properly to give you the utmost comfort and security ensuring reliable, non slip products. We invite you to have a look at what LivingRoc has available to help you transform your surroundings. From the BATHROOM, OUTDOOR PATIO, KITCHEN, LIVINGROOM and the DINING ROOM we are sure you will find your needs.